Hip hop in India is rising. So do the culture of it. Hello and welcome to another post where we are going to post song samajh mein aaya kya lyrics sung by Emiway Bantai. 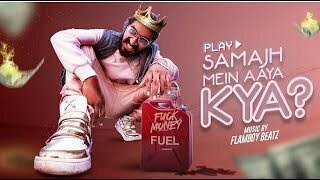 Samajh mein aaya kya is a hip hop diss track which pointing towards another hip hop rapper Raftaar. If you don’t know what a dis track is, it is basically a song sung to disrespect somebody.If you want to know more, you can read about it here. There was a rap battle going on since a time between Emiway Bantai and Raftaar.They were releasing consecutive dis tracks to dis each other. Fortunately the battle has ended now. But, in this battle we got some great raw hip hop songs.Samajh mein aaya kya is one of those songs. Lyrics of Samajh mein aaya kya song are all about what happened between these two hip hop star and why they separated.At the same time they the lyrics deal with a great sense of rhythm and rap. Vo saara paisa Bantai tune lagaya kya? Maangne ko paisa mai ghar tere aaya kya? Bhai maanta tha aur tune bataya kya? Emiway paisa kamaya kya ? Rapper ka naam kya hai?" Mai independent artist hu, aur koi hai kya yahaa pe? वो सारा पैसा बंटाई तूने लगाया क्या? रैपर का नाम क्या है? " एमीवे: "हाँ ऍम सी स्टेन।"
मैं इंडिपेंडेंट आर्टिस्ट हूँ, और कोई है क्या यहा पे? This song is amazing.It is full with enthusiasm and fun.Hope you guys liked samajh mein aaya kya lyrics.We will soon come up with more lyrics of Emiway Bantai and Raftaar’s songs.